To make the coconut tart shells: Preheat oven to 350F and oil two – 12 mini muffin pans with coconut oil [I used the silicon kind, so no oiling was necessary]. Whisk egg whites lightly and stir in coconut. 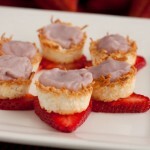 Drop a large spoonful of coconut mixture into each cup, pushing it evenly into the bottom and up the sides. Bake for 8-10 minutes, or until golden brown. Let cool in muffin pan. 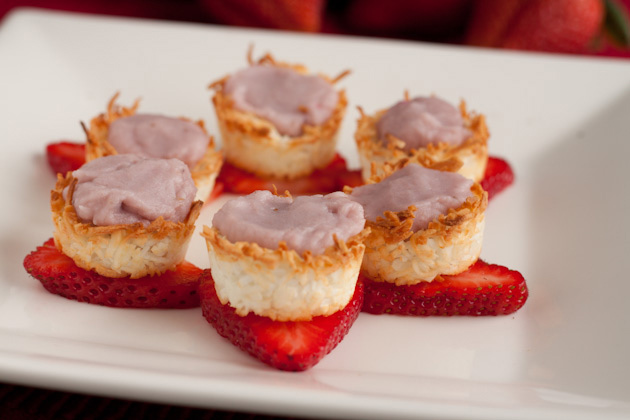 To make the strawberry coconut cream: Melt the coconut butter by placing it in the microwave or soaking the coconut butter jar in a hot water bath until butter is melted. Place coconut butter in a small bowl and mix in strawberries [it will seize up a little bit, just keep warm]. Drop into cooled shells by the teaspoon and allow to set in the fridge. Remove cold tarts from the muffin pans and serve.